Patricia Schultz is not only one of our owners, she also holds the title of Creative Director. Patricia oversees the stores creative process and is our designer, artist, and visionist. Born and rasied near Liverpool, England, Patricia has always had an artistic “eye”. She began her career as a high school art teacher in upstate New York and later worked as a greeting card artist in Boston, Massachusettes. While raising her two children, Patricia started her own business of selling her artwork at local shows. When she and her husband opened their first antique store on Cape Cod, she sold hand-painted furniture and designed her own merchandise. You may have first met Patricia when she and her husband started their first shop, appropriately named “Patricia’s”, in downtown Plant City. She and her husband also own and operate “The Brimfield Barn” which is regulary featured by Lara Spencer on her show, Flea Market Flip. There has never been a moment when Patricia was not working on a project……from quilting, embroidering, painting, sewing, and everything inbetween. 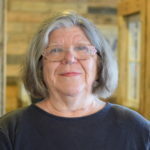 Patricia is now using her talents as the Creative Director of The Mercantile……where she is responsible for the “look” of the shop, the displays, and coming up with new ideas for inventory. Stop by and see The Mercantile, as she continues to make it a great place to shop!